On Saturday morning, the sound of honking cars echoed up and down 79th Street. 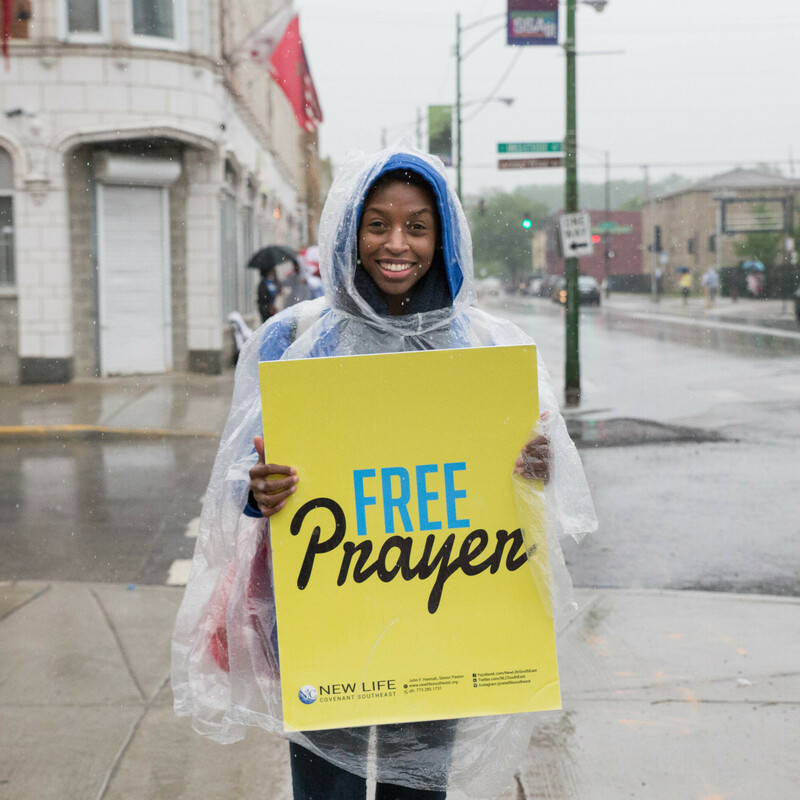 Passersby were responding to a group of young people waving signs reading “Free Prayer” and “We Believe,” as part of the Prayer on the 9 prayer line and peace march. Organized by local pastor John Hannah, who leads the New Life Covenant Church, the event is aimed at protesting gun violence and remembering lost loved ones. Last year, the march attracted an estimated 2,000 participants, who lined up along a nearly two-mile stretch of 79th Street. 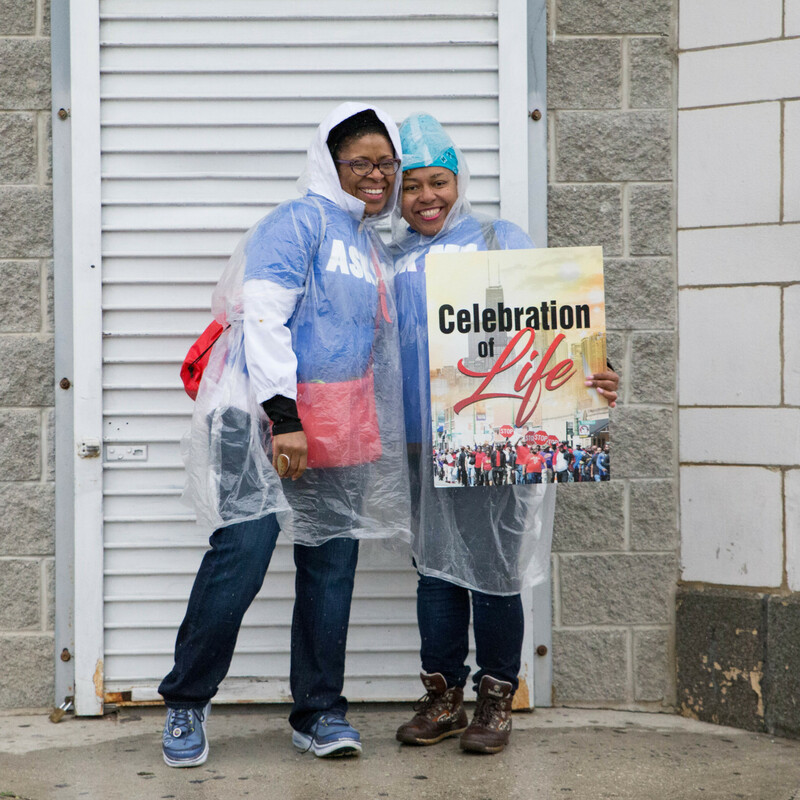 This year, heavy rain and approaching thunderstorms drove many indoors, but hundreds of people still congregated along the street, clutching umbrellas and donning clear plastic ponchos. To Ashley Johnson, a youth ministry leader at New Life who lost a cousin to gun violence, the day was about supporting those still struggling with the death of a loved one long after the death. 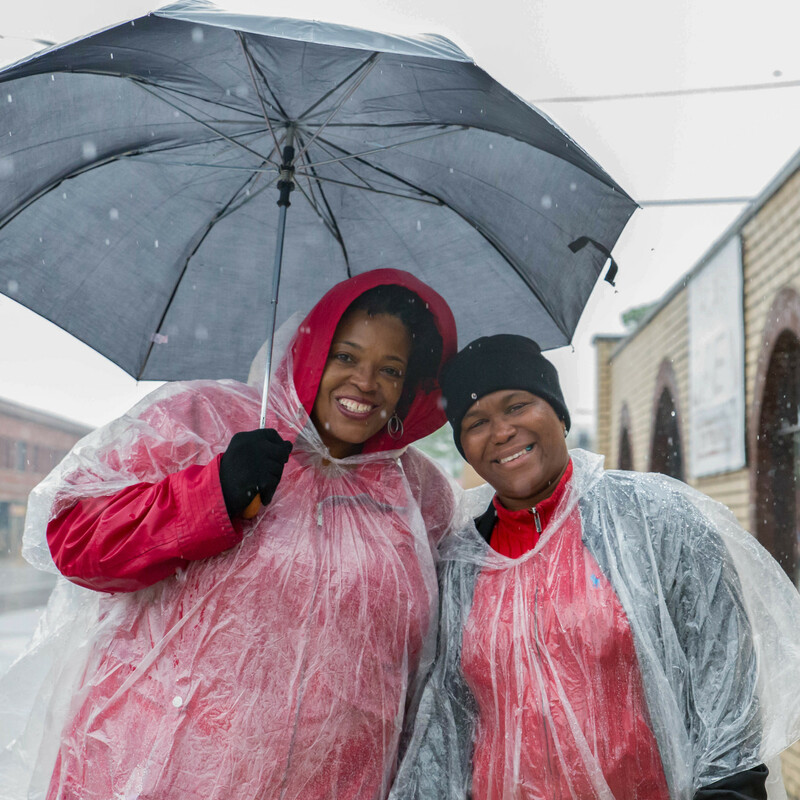 Ann White, a Bronzeville resident and New Life Covenant member, echoed Johnson’s sentiment as she took shelter from the rain in a doorway on the corner of 79th and Ingleside. The street has faced mounting difficulties in recent years, including a spike in gun violence. In 2014, CPS teacher Betty Howard was killed by a stray bullet as she was working a second job at a real estate office on 79th Street. Her death sparked anger in the community and helped spur the creation of a new nonprofit, the Greater Chatham Initiative. 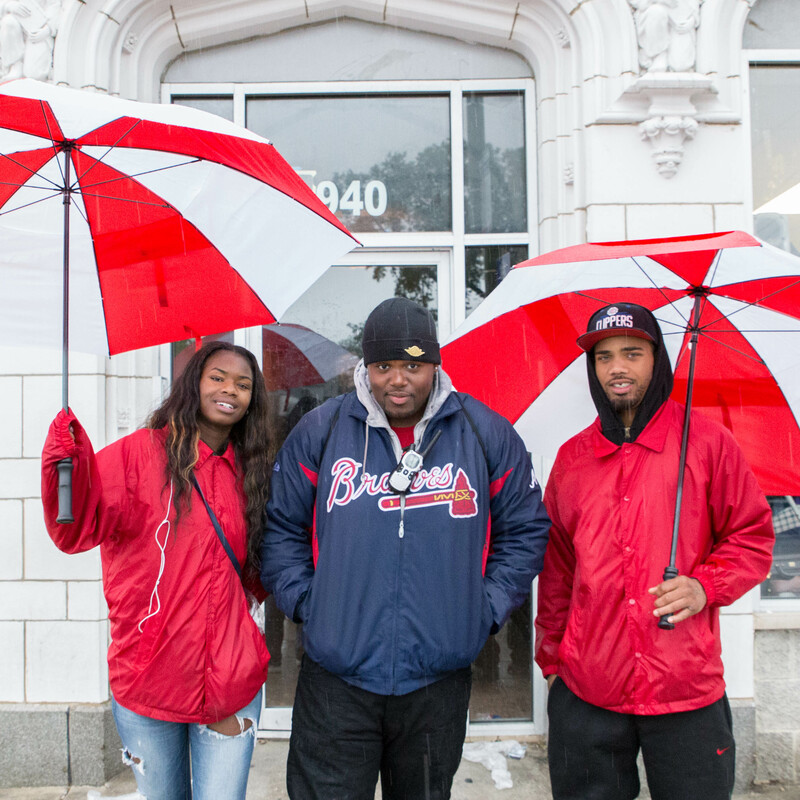 Some residents, like Thomas Adams, hope that these kind of initiatives and the work of institutions like New Life will help revive the street. Eventually the unrelenting rain forced organizers to reschedule the march. Some residents decided to march anyway. 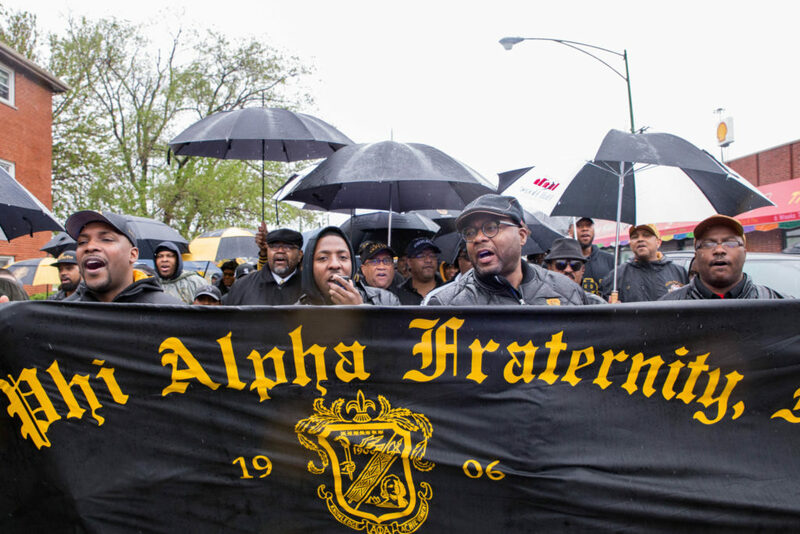 Despite the cancellation of the New Life march, a separate march organized by the Alpha Phi Alpha fraternity continued as planned, with well over a hundred men clad in their fraternity’s black and gold colors, all advancing down the center of 79th Street, shielded from the rain under dozens of umbrellas. Other residents returned to New Life. At the corner of 79th and Cottage Grove, about a dozen people formed a circle and began to pray after hearing news of the cancellation. One man cried out, “thank you for allowing us to be your vessels and servants, oh God.” The prayer concluded with cheers. Among those in the prayer circle on the corner was Sharon Winston, who emphasized her continued dedication to ending crime in her neighborhood. (Correction 05/29/2017): A previous version of this story mistakenly stated that the Alpha Phi Alpha fraternity march was part of the Prayer on the 9 march. In fact, they were two separate marches. For clarity. The Alpha Phi Alpha March was actually a separately planned March occuring at the same time. Our first March on 795th occurred in March 2015 and this was our second March on 79th. We had approximately 300 marchers. Our General President Everett Ward PhD participated as well as Commissioner Stanley Moore and State Sentator Donnie Trotter who are members of the Fraternity as well.